After a rugged Week One of the star-crossed 2018 FEI World Equestrian Games, there are hopes that Week Two will have less drama. The WEG, which required an enormous effort to stage at the Tryon International Equestrian Center in North Carolina, underwent some criticism for the amount of work still left to be completed at the venue by the day of the low-key opening ceremonies. But the real problem was the weather, even as Hurricane Florence was downgraded to a tropical storm and then a “tropical depression.” The prospect of heavy rains and wind on the WEG’s first Sunday led to cancellation of the dressage freestyle – the highlight of that discipline’s program for spectators. It could not be postponed because of rescheduling problems related to equine air transport and logistical difficulties. The weather also put off for 24 hours eventing’s show jumping phase, which is contrary to the tradition of the sport that calls for show jumping to follow cross-country by a day as part of the test for the horses. 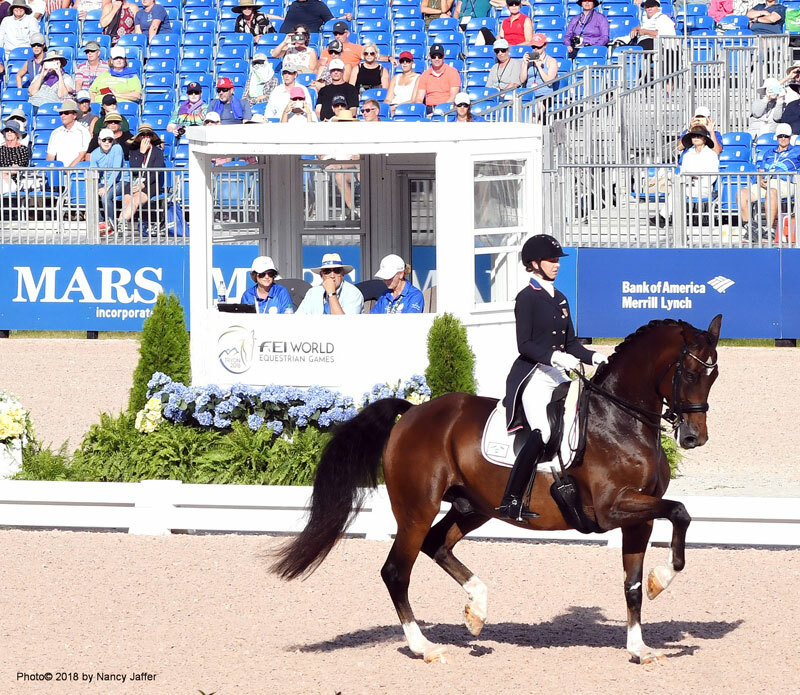 The dressage and eventing snafus came on the heels of the extremely controversial cancellation of the endurance race six days earlier, when it was deemed too hot and humid to continue the competition in the interest of horse welfare. The race was botched from the beginning, with misdirection of some riders causing mass confusion. The fallout from the endurance situation led to a barrage of questions during a press conference with FEI President Ingmar De Vos, FEI Veterinary Director Goran Akerstrom and Thomas Timmons, president of the endurance veterinary commission. There were 53 horses treated at the vet clinic after the ride, 52 of whom were admitted for metabolic reasons, with 32 needing intravenous fluid. One horse, a 20-year-old Anglo-Arab was euthanized after being treated for kidney problems. It’s no secret that central North Carolina in early to mid-September is prone to high heat and humidity, while it also can be a target for hurricanes. So it was no surprise to find the media wondering why Tryon was deemed suitable as a WEG site. The veterinary director said the FEI made a study of the weather in the area for the last three years, which led to the decision that the WEG should be moved into September. That was two weeks later than it was scheduled when the original organizers in Bromont, Quebec, had financial problems that put an end to their attempts to host the world championships in eight disciplines. But frankly, TIEC was the only bidder for the 2018 WEG and if it couldn’t be held there, it couldn’t be held. TIEC had less than two years to prepare after it was awarded the Games. Although stabling and many facilities were in place, much more needed to be done. Organizers had come up with an overly ambitious plan that required a lot of building. Heavy rain and high temperatures in the months before the WEG meant the work was still going on and construction debris was everywhere when athletes arrived. British dressage rider Carl Hester said the place looked like Beirut when he first saw it. Arenas and stabling turned out to be fine, but work went on around the clock on other projects as the competition began. Substandard housing for the grooms was one high-profile issue that had to be rectified. A hotel that had been planned was never built, and an athletes’ village did not materialize either. Opening ceremonies were basically a parade of flag bearers from 68 countries that preceded a country-western concert. The WEQx Games envisioned as evening entertainment were cancelled, and equine demonstrations planned for the first week were not held. Despite the threat of Florence, the venue was looking much better at the end of the first week. The hurricane’s effects were felt in other ways, though; many emergency personnel and other state employees who were deployed in connection with the Games had to leave, as the governor imposed a state of emergency and called out the National Guard because of the storm. The issues involved with the Tryon production naturally raised concerns about whether the WEG should continue. The compilation of world championships in eight disciplines is unwieldy in terms of cost and scheduling. The original mission involved enabling people to see disciplines other than their own, but with several competitions running at the same time, that is often impossible. Most of the organizers who have hosted the WEG, which began in 1990 as a one-off staged in Stockholm, Sweden, have had financial problems as costs spiral beyond the budget – something that can only be fixed with cash often seems to go wrong at the Games. There is a conversation about returning to stand-alone world championships, or perhaps combining world championships in two disciplines that could work well together, such as eventing and driving. At this point, an educated guess would be that the WEG as we know it is over, a victim of its size, costs and complications.